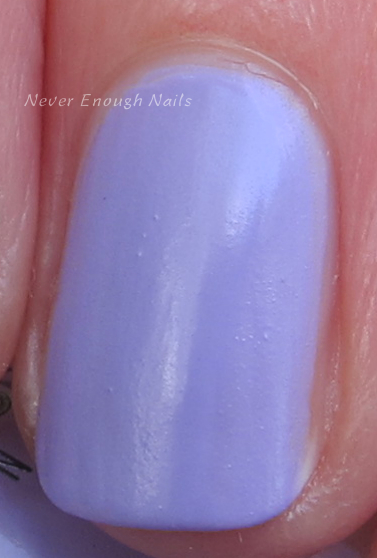 Never Enough Nails: SinfulColors A Class Act Collection Fall 2015 Swatches, Part 1! SinfulColors A Class Act Collection Fall 2015 Swatches, Part 1! Today was 92 degrees here (the start of a heat wave) and it's still July. So naturally, the mall is full of sweaters and leggings, the grocery store has Candy Corn for sale and I'm swatching a back to school collection! Luckily, it's the lovely A Class Act collection from SinfulColors, so I don't mind at all! First up is SinfulColors Chalk It Up, a satin matte pistachio green. This collection has a couple of this demi-matte finish, and I quite like it. It's not as flat as a traditional matte, it's kind of a nice soft finish. 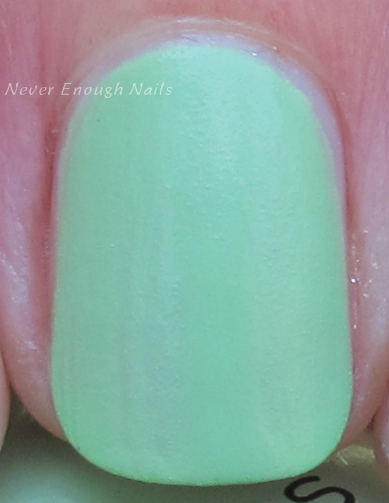 Chalk It Up is a great slightly yellow-y mint green. This is two coats of Chalk It Up. It was nicely opaque, but definitely let each coat dry before applying another, as it can streak a bit (typical for mattes). You can see that it's not a blue-green from the sunlight picture below. The real color is sort of in between the sun picture and the two shade ones. SinfulColors Burst of Fresh Flair is what I like to call "baby chicken yellow". It's a bright, yet soft, shimmering yellow. 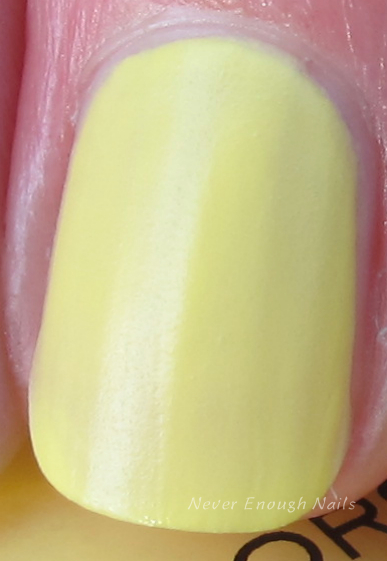 SinfulColors calls it a "pearlescent lemon yellow". This is three coats of A Burst of Fresh Flair. You can still see some VNL here, but it doesn't bother me too much with this shimmering color. It had an easy to apply formula. SinfulColors Truth or Lavendare (** note- I originally confused this with another color I received, Hazed. You'll see Hazed soon, but this is Truth or Lavendare. Sorry, I shouldn't write posts late at night!) is a pretty demi-matte brightened lavender. It's brighter than a pastel, but softer than a real bright or neon. In some lighting, it looks more blue-violet than others. This is two coats of Truth or Lavendare. It was pretty smooth to apply and nicely pigmented. One thing I like a lot about this back to school collection is the inclusion of several great summer colors, like SinfulColors Summer S-cool. I need to ease out of wearing summer brights, I can't just quit cold turkey. 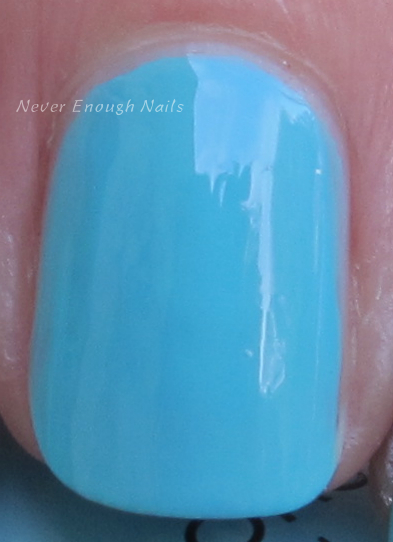 This bright robin's egg blue creme will be great for those hot days in September. This is a gorgeous clear sky blue, and you know I can't resist a great blue! This is three coats of Summer S-cool. It seemed pretty sheer on the first coat, but it built up really well by the third coat and it was nicely opaque in the end. It had a great formula too. I don't think I'll be waiting until fall to wear this! 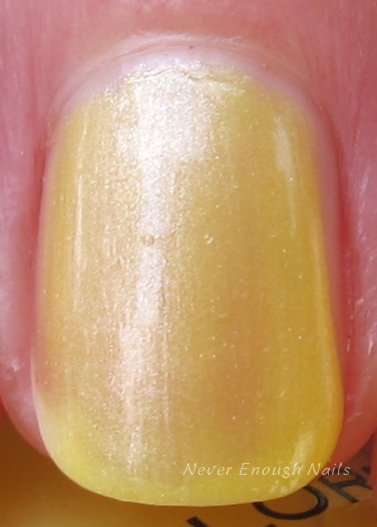 SinfulColors V.I.Peach is another of the demi-matte finish polishes, this time in a soft pale yellow. I love this creamy pastel yellow in the satiny finish, it looks so yummy! Like creamy butter! The name V.I.Peach makes me wonder why it's not more peach colored, but I guess peach skin is yellow sometimes. This is three coats of V.I.Peach. It was opaque in two coats, but was a little uneven. Just make sure to let each coat dry completely before applying the next. I don't think I let my first coat dry enough, so it wasn't completely smooth. So what do you think about these? I like them a lot, especially Summer S-cool and the demi-mattes. Are you seeing all fall stuff and back to school where you live? The Sinful Colors A Class Act polishes will be $1.99 each at Walgreens and other mass retailers for August & September 2015. I will have a few more of these swatched for you soon! Don't forget to check out SinfulColors on their website and social media pages.